Peer-to-Peer is a network protocol for computer users that allows to search and download content. Because of the unique structure of the network, it is very efficient for downloading large files. On a Peer-to-Peer network, when a user is searching for a specific file, the installed software is locating the copies within the network. It then allows the user to create multiple connections with several sources that have all or part of the requested file. As parts of the file are received, they are also uploaded to other users that are requesting that file. Most commonly used example of Peer-to-Peer (P2P) software is torrents, therefore many users are using VPN for torrenting. However, nonetheless, there could be other applications using the same network principle or even some websites. When using P2P traffic on non-P2P friendly VPN server, you will receive the following messages. Some data centers that we are partnered with do not allow P2P traffic, instead of cutting off users connection completely when they connect to a non-P2P supported server, we have deployed an automated mechanism on them which is called Stateful Firewall. This firewall uses a module which checks for torrents fingerprint in the packet and then reroutes the traffic coming from an internal IP address to a server that allows P2P. This module allows us not to log any identifiable information like your OpenVPN/IKEv2 username or public IP address and we also do not see any of the traffic content, only the type of it. Simply, if you are using VPN for torrenting or similar activities, you’ll have to be connected to a VPN server which supports P2P traffic. The easiest way is to find and close the application which utilizes P2P traffic, and afterward, disconnecting and reconnecting to the VPN server. If you are not sure what could be causing it, simply restart the computer and try the connection again. If that does not help, try closing applications one by one, and reconnecting to the VPN servers. Sometimes, even if you close the P2P application and disconnect the VPN, you might be receiving the same error message due to the browser cache. If that is the case, try clearing the browser cache or simply try another browser. Do you have a firewall for blocking out P2P connections? Hello. We do have a system that detects P2P packets whenever you are using this sort of a connection on non P2P friendly server. I use the ProtonVPN plan and I have some questions. Do secure code configurations (like Netherlands via Iceland) support the P2P protocol? Or is it an obligation to be connected with the specific server configuration which allows P2P? Hello Theo, Secure core servers are not for the intention of using P2P software as that would not benefit for the connection speed but rather security, thus we suggest using standard p2p servers for those specific activities. I am trying the free version and it allowed me to download p2p with utorrent and it went fine. I hope to see if it is continually good over the next month and if so, sign up for a paid account. If your IP lookup returns a different IP to the one you configured your client for, see the information and links below. In summary, ProtonVPN will automatically route you to a Canadian server (or their other P2P servers) if you have any type of P2P running. This is done without notification to you. Sorry to be late at the party! Everything is fine, this is our IP address. This is the Canadian P2P server IP and you will get redirected to it if you are using something like torrents while connected to a non-P2P server. We have another P2P server in the Netherlands for the same purpose. See the dedicated p2P servers at the link below. Hello Tom, thank you for explaining it to our community, but I`d like to correct you a bit, it is done with a notification and its shown how they look in this guide itself. I just signed up for the Free Version of ProtonVPN. I understand the free version does not permit p2p, but it stated that as a gift, I was being allowed the full premium version of ProtonVPN for 7 days. It really does seem to respond well, and I may upgrade. 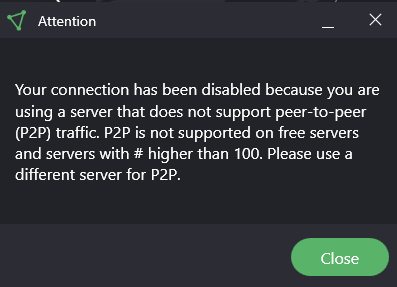 But currently, with the trial premium version as part of a new signup, do ANY ProtonVPN servers support p2p? Many thanks! Hello Robert. Plus and basic plan users have p2p supported servers. You can identify them with the two arrows pointing different directions.